Badd. Color Me Badd. Ooooh, two D’s, that must be really bad. I was looking around a thrift store and I found some copies of Disney Adventures from 1994! Two of them had missing page so I only bought the one that didn’t. That meant classic Disney comics from the 90s! Wooohooo! I wish I have a scanner. The magazine have an interview with the boy band. I have never heard of them until they appeared in Beverly Hills 90210 in season 2. At the moment I’m watching season 3. 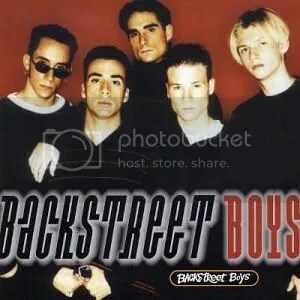 After listening to some of there songs, and watching a few videos, I decided that these guys have great harmony, can sing, and have some really nice songs. Too bad they look like douche bags and can’t act. They make me gag. Here’s the interview. They’re back and firing! Color me Badd have taken a bit of time preparing their second album, but the wait has definitely been worth it. Their new album Time and Chances is cool, groovy and hard to stop playing. Disney Adventures went to a special barbeque to meet CMB’s Bryan Adams, Kevin Thornton, Mark Calderon and Sam Watters. Bryan and Sam did all the talking, the others were having too good a time eating! 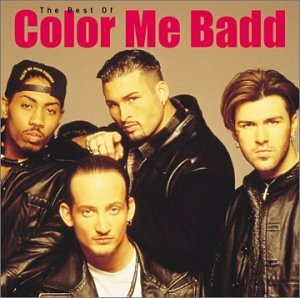 Here’s what’s cooking with Color Me Badd, who began as a group doing doo-wop harmonies in the corridors at school. Well look where music has gone today. That’s exactly what’s happening now. Music in the 90s were great. The group has been influenced by top harmony acts such as The Temptations, The Four Tops, The Dells, and even people like Sly Stone and The Beatles– in fact any band with original sound. You must be grateful for your simple beginnings? Bryan: Definitely. We are best friends and have been since those school days. We know each other really well, and if one of us gets out of line, the others are there to bring him back down to earth. You also have faith in God, don’t you? Sam: We were brought up in the Christian religion, but we are open-minded as far as other religions go. We know God is love and it is our faith in him that keeps us down to earth. What are your feelings about your new album? Sam: We love it, it is something we worked very hard on. We worked for about a year on. We wanted to make an album that was full of songs all four of liked. We are all very critical, so it is difficult to come up with a song that all four of us like. So that was the formula we stuck to. We also wanted to give people their money’s worth — so our album has got 19 songs on it. Is it more fun being famous or do any of you wish you weren’t? Bryan: It’s kind of fun being both. It’s a great feeling to gain fame. But the stuff that’s most fun is the stuff anybody can do. Like going back home to Oklahoma and hanging out with the people we went to school with. People back home treat us the same as they did before our fame. So your attitudes haven’t changed? Bryan: No, we are just more comfortable these days. What is the one thing you wish cost nothing? Sam: That’s a neat question. Let me think about that … food! When you aren’t touring, what do you guys do? Sam: We go to films and we like to play basketball. What do you hope your fans will get from this album? Sam: I hope they love it first of all. It’s our fans we had in mind when we were doing the album. We hope there are songs that can help them when they are going through their lives. Sam: A U.S. tour. The last tour we did went for 1 1/2 years. We like touring, it’s a really great way to see places and meet our fans. Bryan: We share the same dream. We’ve had that vision to be singers since school. We are best friends who like being together and we are doing what we love doing. These guys need to buy themselves a thesaurus. Or read once in a while. They’re song writers, you’d think they would have better english. ‘We are doing what we love doing’? They sounded like really nice guys who are really greatful for their fans. Even though they are no longer famous, I wish them happiness.